Electromagnetism is the force that causes attraction and repulsion between charged particles and between magnets. This force is responsible for almost all interactions, including how a car runs, how electronic equipment is powered, and how high-voltage electricity from a power plant is converted to a lower voltage for use in the home. 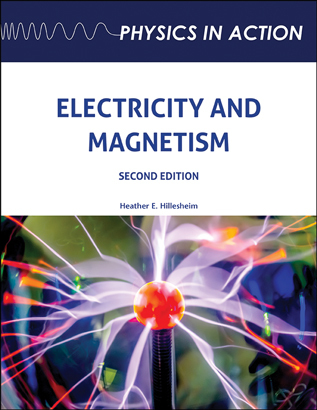 Electricity and Magnetism, Second Edition explains the basics of electromagnetism, including what electricity and magnetism are and how they interact with each other, giving physics students a complete understand of this fundamental force. Heather E. Hillesheim graduated from North Carolina State University with a bachelor's degree in textile chemistry. After pursuing alternative teacher certification, she began teaching high school science, where she discovered her passion for physics. She created an AP Physics B course for her school, in addition to teaching many other subjects. Hillesheim works for an online school, developing curriculum for virtual science classes.